I officiate a lot of weddings. 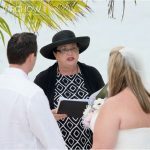 I have never tried to add up all my weddings over the past 15 or so years, but I know that since April 2008 I have officiated more than 550 weddings. Every wedding is special, to you, and to me, but sometimes a wedding stands out in my mind so much I know I'll never forget it. Again, I see brides cry tears of happiness, and grooms get choked up with emotion every week. When I first became a marriage officer, I used to "tear up" myself, because of the beautiful words of the marriage ceremony. 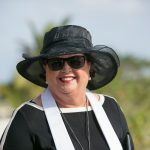 Today, at this wedding, I had tears in my eyes, as did many of the guests. Today's garden wedding for local doctor & his artist wife. This wedding was special, because it was planned with loving care, and everybody present felt that love in the very air around us. The couple chose to prepare something special to say to each other. 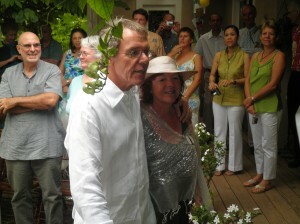 The groom presented his wife-to-be with a sculpture crafted by his father, part of a series of sculptures given only to the wives of the family. I think the tender way he spoke to her touched all the guests, certainly I felt very privileged to have been a part of the occasion. The wife told a story, as she had told me she would, about how to make a marriage last. She told it well, with enthusiasm and humour, and I hope one day she will write it down for me to use in one of my ceremonies. 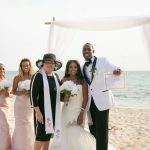 The wedding was attended by many in the medical community, with the couple's children, grandson, and the bride's sister and brother-in-law also in attendance. The ceremony was conveyed to family and friends in the Nederlands via Skype, which was a new twist for me as I am a big Skype fan. Seen here, white tulips the Groom presented to the Bride after she was escorted in by her son. Near the tulips you will see the special sculpture which could also be worn as a piece of jewelry. This has been a most interesting week for Isobel and I. First we had a couple who live in Sweden, then we had an Irish couple, then a bride from Germany, with a groom from the UK, and today a couple from the Nederlands. We are busy planning a wedding coming up for a couple from Ecuador, and of course a few weeks ago we had a bride from Serbia and a groom from Australia. We were also happy to see that Westjet airlines has begun its service to Grand Cayman from Toronto, three times a week and we are already seeing bookings coming in from Canada. 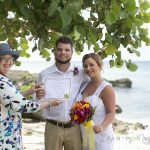 In the meanwhile we continue to welcome our USA couples, from every state in the union and look forward to making your Cayman wedding, wedding blessing, or vow renewal an event you will always remember. 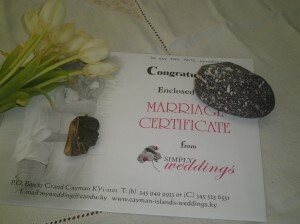 Please follow our weekly, sometimes daily, weddings on Facebook at www.facebook.com/SimplyWeddingsCayman for lots of up-to-the-minute wedding photos, wedding locations and other Cayman wedding news and tid-bits.